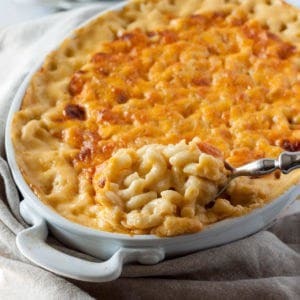 For years I’ve been trying to figure out that exact combination of those basic macaroni and cheese ingredients to make a baked macaroni and cheese recipe that came out creamy enough for me, but still in that Southern Macaroni Pie Style for my classic-loving husband who always wants it from the local soul food restaurants. People: I have done it. Creamy but not saturated like a pan mac and cheese, this recipe is, in my humble opinion, the perfect macaroni and cheese. You can change the cheeses, you can change the milk. You will, I know you will. But I cannot be held responsible for how it turns out unless you use my exact recipe. More extra sharp cheese, or substituting any lower fat cheddar, regular gruyere, etc will make the sauce gritty. Using all Medium or Mild Cheddar will make it more gooey and bland. Substitute gouda or fontina and you’ll get more of a pan-style sauce. Update: Okay, people. As predicted, I’ve gotten a lot of questions about this recipe. Let’s take a minute to answer some so you don’t have to comb through the comments if you have a similar question about how to make this an easy mac and cheese recipe! Let’s keep it short and sweet, shall we? 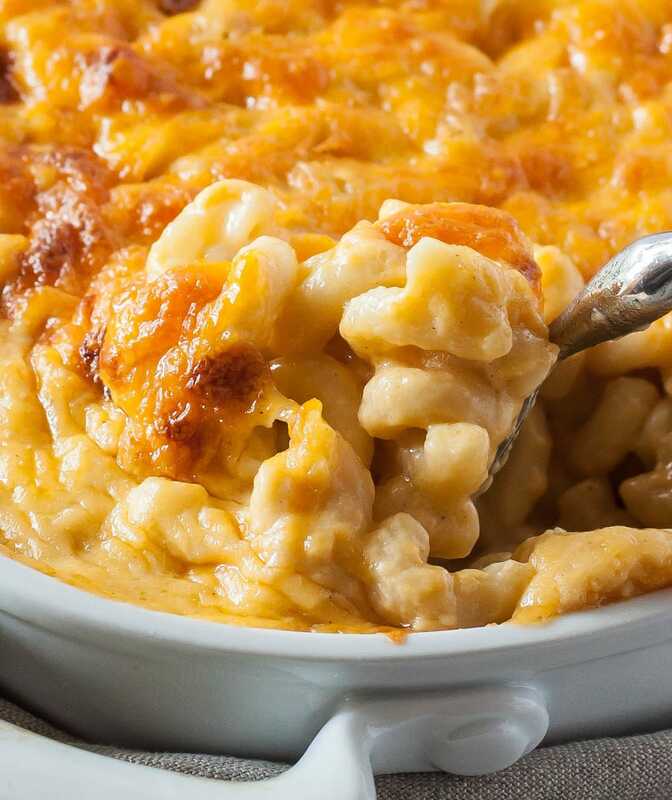 What is the best cheese combination for macaroni and cheese? People. It’s what I put in the recipe: Medium Cheddar plus Extra Sharp Cheddar. That’s why I chose those cheeses, and that’s why ( IMHO ) this is the PERFECT Mac and Cheese recipe! Can I substitute all Extra Sharp Cheddar, Muenster, Brie, Aged Cheddar, an old shoe I found behind the QuickMart? Sure. But like I said above – the cheese changes more than just the flavor. It changes the TEXTURE! And I strongly feel the cheeses I’ve listed in the recipe create the perfect balance of sharpness AND texture. Can I freeze mac and cheese? You sure can – but be aware: dairy and the freezer don’t always love each other, and frozen mac and cheese that’s been reheated is never going to be good as the fresh version. If you’d like to freeze it, I recommend assembling the entire recipe, baking it at 425 F for just long enough to get a little browning on top, letting it cool completely, then wrapping it and freezing. What to eat with mac and cheese? If you want to go full-on comfort food, my Crispy Oven-Baked Chicken is a great route for a protein to go with mac and cheese. If you want to shake things up a bit, Honey Rosemary Pork Chops are easy and a little lighter. With either protein, I love a fresh salad to balance out all that cheese! what are some other amazing holiday side dishes? Sprinkle the flour, white pepper, salt, and cayenne pepper over the melted butter, whisking until smooth. Stir in the milk 1/2 cup at a time ( feel free to eyeball it ), only adding the next half cup once the previous one has been incorporated entirely. Add all of the medium cheddar cheese and half of the extra sharp cheddar cheese, stir into the milk/flour sauce until melted. Stir in the macaroni. Pour into a 2 quart baking dish. Top with the remaining extra sharp cheddar cheese. I’m not even done eating this yet but I couldn’t wait to comment! This is sooo good! An amazing classic macaroni and cheese. I like a fancy cheese dish once in awhile, but this is a real comfort foodie, make for your friends (or yourself, whatever) kinda dish! The very Best Mac & Cheese Ever! I had leftovers at my daughters house… 2 days ago. For Moms Day. I scooped a portion for me added a tad bit of water, a Lille ground pepper & a little dab of real butter..
… and 2 days old & heated up! Is 8oz of each cheese before you shred or after you shred it? Thanks in advance! The 8 oz is a measurement of weight, so you should be good either way! I make it easy on myself and buy the 8 ounce blocks of cheddar from the store. You shouldn’t have even answered her… That was the dumbest question ever ???????????? Eavesdropper-That wasn’t very nice! Intentionally trying to embarrass someone just shows your lack of character. I think you should apologize. If you don’t have enough character to do that, you should delete your post. Young cooks don’t know, and by the way only dummies don’t ask questions,Your answer was a totally rude and a not called for opinion. You can absolutely make it ahead – I do that all the time. It shouldn’t lose any creaminess. Let me know how it turns out! I’m not a mac and cheese fan. My husband and boys are. 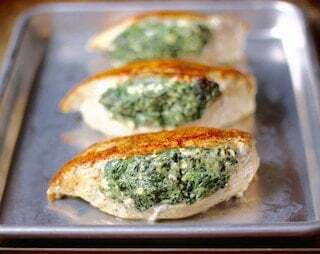 I made this recipe with my fingers crossed that maybe I would enjoy it (since it’s baked not stovetop) and the rest of the family would too. IT’S FANTASTIC! I’ve made it for every family gathering in the last month and still getting requests for more. Thank you for a wonderful recipe! Would I still get something similar with 1% versus 2% milk? I’m trying to use ingredients I already have. Mac n cheese is one of my favorite dishes, so I am always looking for different recipes. This was delicious! I did add chopped bacon in it and on top, also a can of Rotel tomatoes. Delicious and very creamy! Thanks for the recipe! is the 16 oz of macaroni before cooking? I got a 16 oz box and it just seems like a lot of maxaroni. Yep, 16 oz box is perfect. It makes a lot of macaroni and cheese! Is there any way to see “dummy” pictures of what it should look like steps 4-5? I’m worried I did it wrong. It’s in the oven now. Hi! At some point I’ll try to get some pictures up of what the roux should look like, but essentially you want it to be a dry, light brown paste, and then as you add the milk it should become a thick, creamy sauce that is smooth / without lumps. What is the difference between white pepper and black pepper in taste or whatever? I’ve never used white pepper. The spice level is more of a mild but slower burn than with black pepper. However, if you can substitute a pinch less of black pepper if you must and it will still be wonderful! If I prepare this the night before, does it change the baking time and temperature? I have literally never made a baked Mac and cheese before so I made this for the first time tonight as practice for Thanksgiving. It was so easy and yummy! My four year old NEVER asks for seconds but she wanted more of this Mac and cheese! I know it’s a good recipe when my daughter is impressed ???? Hi there, This may be a stupid question, but do you cover this when it’s baking? Use a 3 quart dish for this recipe! You have been warned! I’ve never had an issue with my 2 quart corningware dish, but it does go RIGHT up to the top! It did spill over the top of my 2 quart dish. Apparently my stovetop is not level. Lol. I had to take out about 1/3 cup of pasta to be able to move the dish into the oven without any more spillage. Very tasty mac & cheese though! Yes! I used a 2.5 because that’s what I have and it’s heaping past the rim! Hi Kristin! I always shred my own cheese for this recipe and definitely recommend doing it that way over buying pre shredded. I was raised in the south & there is nothing better than our mac & cheese. It took me years to come up with a combination to perfect this cheesy art. I make mine almost exactly like yours (milk ratio is slightly different) & I wanted to leave a comment so others would know to look no further because this is it! I moved to VT 5 years ago & they didn’t know what hit them when I bring this dish to cookouts. This is the best looking Mac and cheese I’ve ever seen, believe me, I’ve scoured the Internet to find that Mac and Cheese that looks like my oldest sister and Mom’s. Yours looks better than any I’ve seen on Food Network, Ree Drummond, and yes, Paula ‘too much everything in it’ Deen. I’ll use this recipe for Xmas dinner. I pretty much have always made mine the same way except I add a dash of onion powder garlic powder and dry mustard.along with a couple Tablespoons of sour cream. Can this be thrown in a crockpot to keep warm for a party without compromising the taste? I wouldn’t recommend it – the sauce will be MUCH thicker ( too thick IMHO ). Perhaps watering it down could help though? Per the post – changing the fat content of the dairy will change the texture of the cheese. In the case of heavy cream, you might want to use half heavy cream and half water in order to keep the sauce from being too thick. :-(. First time cooker. I over spiced…. good for me but not sure for others. Is there anything I can add to drop that hint Of spice? Generally speaking, sugar will cut down on spice. Perhaps try serving it with a sweeter drink like tea or a less-than-dry wine? I’ve made this for several parties and people always love it! This weekend’s event is fork-less and I was going to try baking this in a cupcake pan. Have you ever tried that? Any changes to the recipe that I should take into consideration? Was just wondering if youve ever added cubed ham to it? Or any other meats? Ty seems yummy and easy. I have not added ham, but I have done cooked bacon crumbles and it was WONDERFUL! Do you mind sharing the brand of cheeses you use? I change it up, but usually for the medium cheddar I use the bulk yellow cheddar block from Whole Foods, or if I’m shopping at a conventional grocery store, I’ll use Kraft for the medium cheddar. For the extra sharp cheddar, I usually use one of Cabot’s many extra sharp varieties. Using a quality cheddar is important, but I also wouldn’t get TOO nice of a cheddar since the “super fancy” cheddars tend to be aged more and therefor have less moisture, which will make your sauce grainy! I can’t wait to make this! Do you use a certain type of flour? (All purpose?) Thanks! Yes, I use unbleached all purpose flour. Bleached would be fine – unbleached is just a personal preference of mine in all of my cooking. Hello! I have whole milk instead of 2% and extra sharp and mild…can’t find medium in the store and I have guests coming in 2 hours! Should I just try another dish or will this still turn out good? I have guests coming in two hours…can I use whole milk instead of 2% and mild and extra sharp cheese instead of medium? Will the results be so different, that I’m better off doing it another time? What kind of butter do you use? Does it make a difference? I made this following your exact recipe and it was magnificent! Just the right amount of gooey, stick-togetherness and not too cheesy. Am planning on making it again for Thanksgiving – thank you for testing all the different cheeses to figure out the right combination! Have you ever made this gluten free? By using gluten free pasta and cornstarch instead of flour? Would evaporated milk make much of a difference? Yes, the fat content and concentration is different in evaporated milk. I recommend sticking to the recipe as written to ensure a consistent result! I made this tonight and it was too good to stop eating. I anticipated it being a little bit saucier, but maybe creamy and saucy are not interchangeable. My only change was I had to use 8 oz of sharp cheddar in lieu of the medium. I only had sharp and extra sharp in the house. But I will make this again. Pre-shredded cheese will change the consistency of the sauce, but it will certainly not ruin the dish. I always prefer to shred anything from block in order to avoid the coating put on pre-shredded cheese that causes that consistency change, but in a pinch, it will do! I made this for a dinner we had and it was a big hit. I’m going to do it again but I want to do it the night before and put it in the oven the next morning. What changes do I need to make – temperature, cooking time, etc? You can make the macaroni and sauce, combine them in the pan, top with remaining cheese, and then cover and refrigerate until 30 minutes before you’d like to bake it. Then bake according to the directions and you should be all set! That is frequently how I make this recipe, so that I can lighten my day-of cooking load a little! I made this in a double bath for thanksgiving and WOW! There was absolutely none leftover by the end of the day! It has the most creamy delicious flavor and I can’t wait to make this for my family!! Thanks so much for sharing this wonderful recipe! I am having Christmas Eve dinner with friends tomorrow and when I asked the wife what can I bring and she said, “nothing. I’ve got the food covered”, I knew I could count on her husband to come up with something. He and their girls love macaroni and cheese. Since I never made this recipe before, I made it today to test it first. I’m so happy I have my own mac and cheese to keep and make another batch tomorrow. I was a little worried because I don’t cook very often 😱. The only way you can go wrong is to not follow the recipe. I will add more cheese to the top tomorrow but that’s just a preference thing. I also made your pork tenderloin recipe. This might become a thing I do, that is the cooking thing. Thank you! Should this be covered while baking? I followed the recipe, however, it turned out a tad on the dry side and no so creamy. This sounds great to me. I’m just a little worried about the cayenne pepper. I have a sister that doesn’t like anything hot. Does it add any heat to this dish? Yes! It does add juuuuuust a little heat. It would still be wonderful without it. Perhaps even sub a little paprika for it instead! 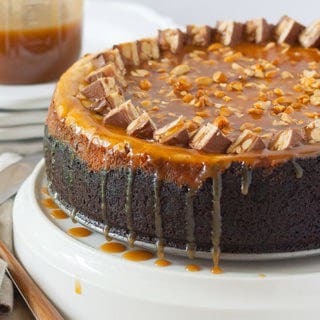 has anyone baked this in a cast iron skillet? Ohhhh I don’t know the answer but I’d love if another reader who has would chime in! i tried it and it came out FABULOUS. my only addition to your recipe was that i did butter up my cast iron skillet first. thanks again for a great family dinner recipe and also for taking the time to respond! my husband and one of the guests are ‘blue box mac’ kind of guys and they both enjoyed it! Does it matter if I use whole wheat flour for the roux? nope! should still be delish! Hi there! I hate to ask about changing the recipe, but here goes… Could I possibly add panko breadcrumbs to the top or would that cause all hell to break loose? Thanks in advance for your help. Have a wonderful evening.